On a snowy November afternoon, fourth-graders from South Bend’s Madison Primary Center came to the University of Notre Dame campus to build a barn. 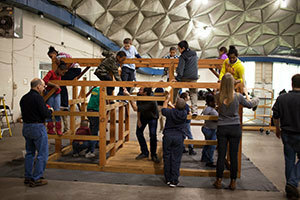 The 21 elementary students met with fifth-year School of Architecture students at the Stepan Center on Nov. 12 (Tuesday) for a barn raising, part of the Michigan Barn Preservation Network’s “Teamwork and Timbers” program. Aimee Buccellato, assistant professor in the School of Architecture, organized the event after hearing about the program, which brings the barn around to various schools and organizations so children in grades four through 12 can experience architecture and history firsthand. Deb Martin, the principal of Madison Primary, was interested in the teamwork aspect. She invited students who she thought could learn from the experience of this after-school field trip. Martin said the students who participated were excited to learn how to build a barn. 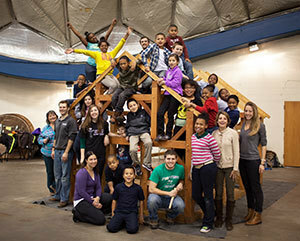 The students started working on constructing the barn in four groups, led by a handful of Notre Dame undergraduates. “I’ve invited some fifth-year architectural students to come and talk to these young students about what it means to be in architecture school, the kinds of things they’re studying, and what it means to be an architect,” said Buccellato. The 1,100-pound timber frame, which resembles a quarter-scale 19th-century barn, comes together like a puzzle. 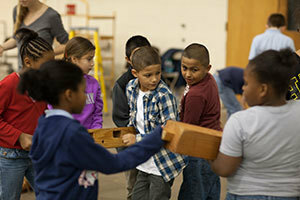 While assembling the frame, the fourth-graders learned about different types of wood, parts of a barn and methods of construction from the Notre Dame students and members of the Michigan Barn Preservation Network. After an hour and 15 minutes, the fourth-graders successfully assembled the timber into a sturdy barn frame, with the help of the Notre Dame students and Leik and his colleagues. The frame is later disassembled and loaded onto a truck to go to the next school.